MC for the evening was Danii Thielke, a former participant from Footscray Girls Secondary College who enjoys maintaining her link with the WynSpeak family. An extremely high standard was set by the 17 finalists, 9 juniors and 8 seniors giving the adjudicators a hard task when choosing the winners. The students choose their own topic for the 5 minute section of the Competition. Their subjects were a window on the world we live in, each speaker infusing their speeches with passion, thought provoking messages and both pathos and humour. The winning student in the Senior Competition was Conor Barnes from Westbourne Grammar School whose speech on separating Queensland from the rest of Australia was quirky, humorous and often tongue in cheek. The runner-up in the Senior Section was Maria Irene Magousis from the Good News Lutheran College. Maria fears for the future of the planet and in particular our profligate use of plastics that are already polluting our rivers and oceans. 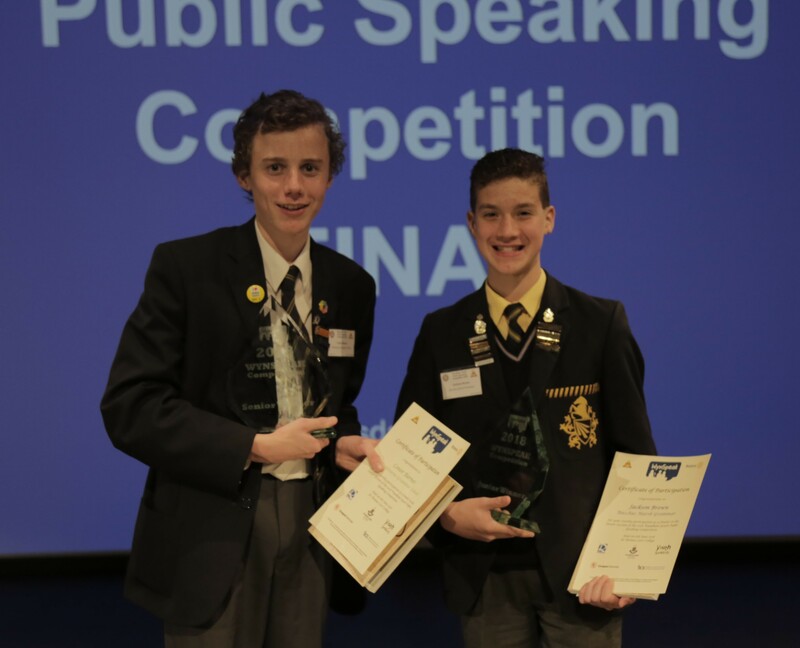 The winning student in the Junior Competition was Jackson Brown from Bacchus Marsh Grammar whose speech on the Great Emu war was insightful and at times amusing. Runner-up in this section was Caleb Frederick, a student at Heathdale Christian College who provided great insights into the efficacy of the popular Ketogenic Diet. An Encouragement Award was presented to Tanvi Arora from Mount St Joseph Girls’ College. 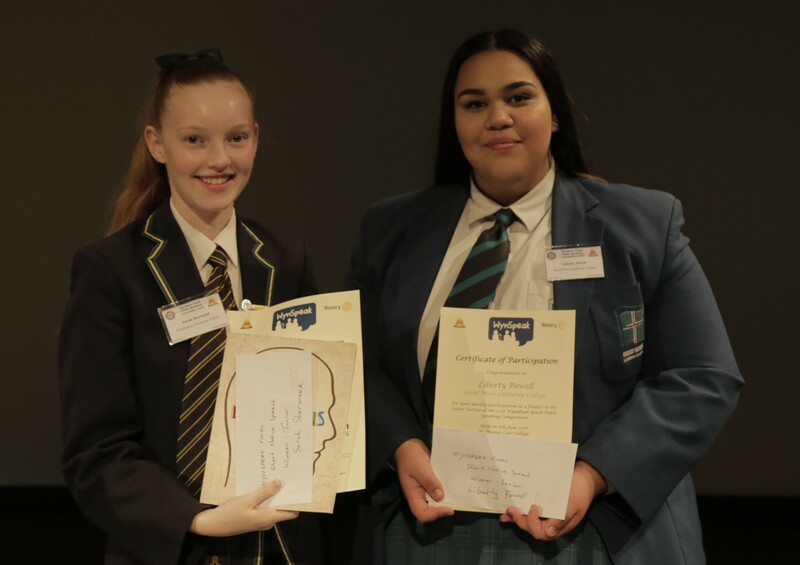 The winners in the short notice section were Senior Winner, Liberty Powell from the Good News Lutheran College and Sarah Sherwood from Westbourne Grammar School in the Junior Section. Prizes in the short notice section are sponsored by Coogee Energy. Four hundred dollars is awarded to the 1st Prize winners in each section and the runners-up each receive $200. 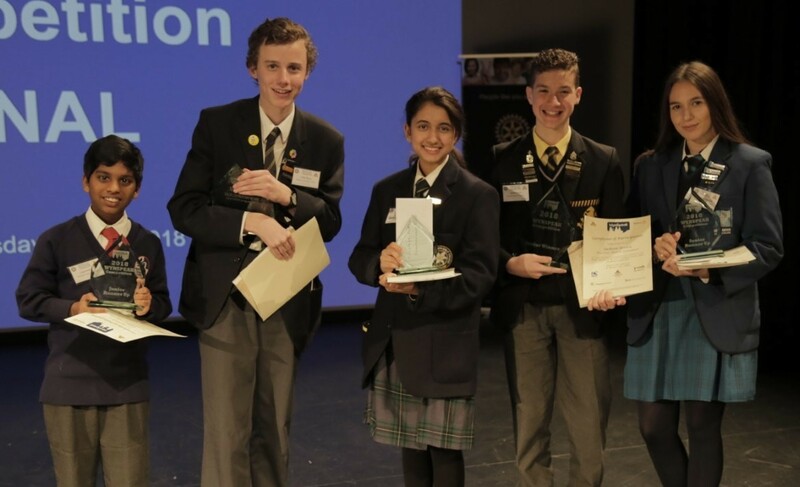 The winner of the Senior Competition and the winner of the Junior Competition have gained direct access into the State Final of Rostrum Voice of Youth competition that will take place on Sunday 24 June 2018 at St Kevin’s College in Toorak. Representatives of the schools attended by the winners in each section were awarded perpetual trophies to display in their schools for the next twelve months. 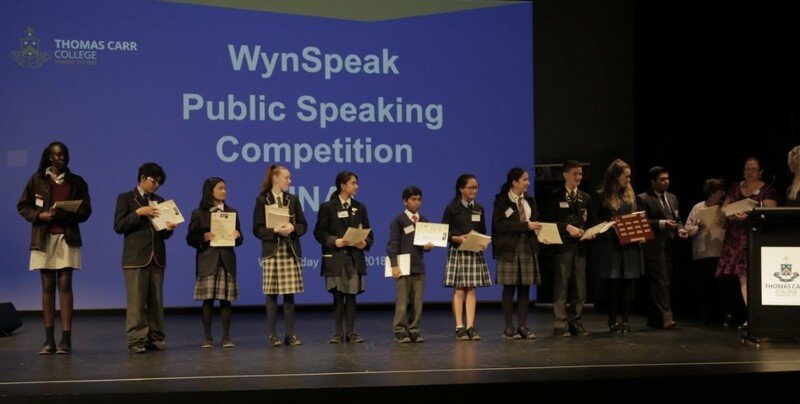 Chairperson Amanda Turner was delighted with the success of the 2018 WynSpeak Competition and said that the speakers over the five qualifying rounds and the final reflected a very high standard. 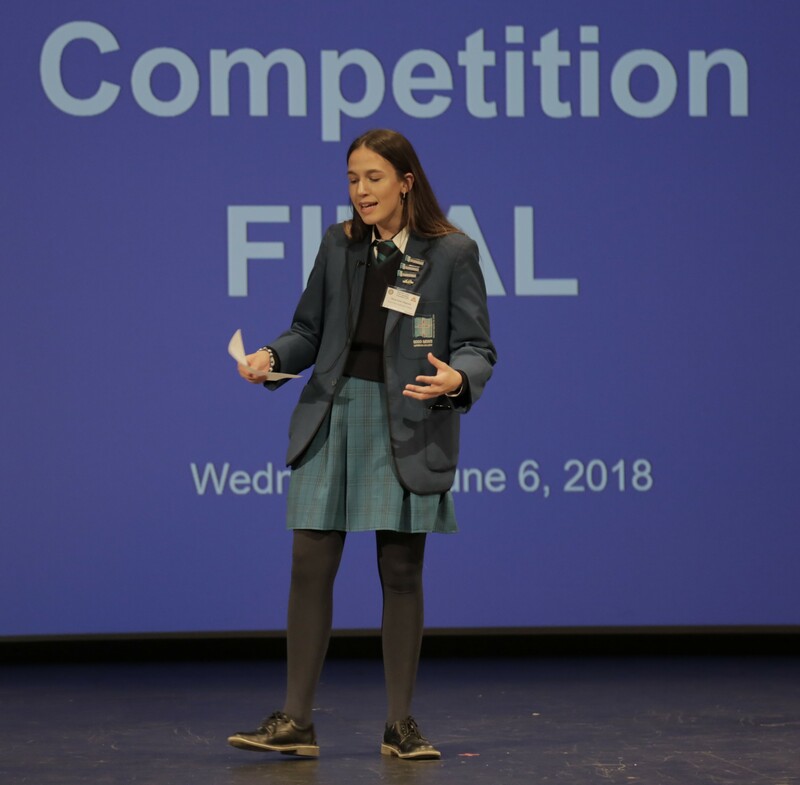 She particularly acknowledged the support of staff at Thomas Carr College where four of the five qualifying rounds and the final were held. 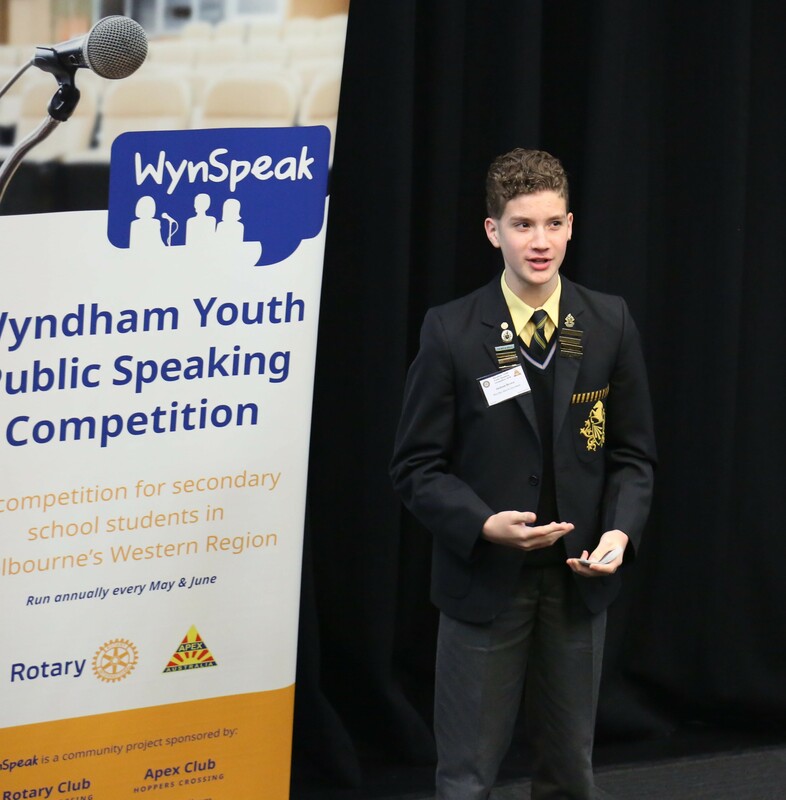 The fifth qualifying round was held in Caroline Springs and hosted by the Rotary Club of Caroline Springs. Amanda acknowledged the hard work of the competition organisers, members of the Apex and Rotary Clubs of Hoppers Crossing, the participating students and their teachers, official photographer Mikayla and acknowledged the support and assistance provided by Rostrum Victoria, the Wyndham City Youth Services with special thanks to sponsors Coogee Energy and Jordan Consulting. Gallery photos courtesy of Michaela Schofield.